Antelope Canyon (Upper Antelope Canyon especially) is one of those classic photographic locations that has become extremely popular over the last 15 to 20 years or so, and to some almost a bit of a photo cliché, but there’s no denying that it produces some wonderful photographic opportunities. It’s also one of those rare locations for photographers where the best light is around the middle of the day and so doesn’t require a pre-dawn wake up call or a anxious wait for sunset. It’s perhaps most famous for the ghostly beams of sun light shining down on the canyon floor produced as the sun passes overhead around midday. For those of you who don’t know, a slot canyon is rather like a meandering cave, with flat sandy base, and tapering walls that narrow upwards and reach the surface as a thin slot. They are formed by rapid erosion during flash floods, where water and sand rush through cracks in the rock and gradually, through time, excavate a sub-surface canyon. From the surface these may appear just as a narrow winding slot, but below often lies something truly amazing. What makes this region unique is that the slot canyons are formed in Navajo Sandstone, a distinctive pinkish to reddish, Aeolian (wind formed) sandstone, formed when this region was part of a huge sandy desert. The distinctive reddish colour comes from a coating of iron oxide on the sand grains which formed slowly after the sand had been deposited. The sandstone is also known for it’s visible cross-bedding which appear as banding and ripples within the sandstone, formed as the dunes moved with the wind. The darker the band, the higher the iron content and the harder the rock, which result in some quite amazing erosional patterns. Erosion still takes place today, especially during the summer monsoon season where flash floods are common. They can happen very quickly at immense pace and be be quite catastrophic. In August 1997 a party of 12 trekkers were photographing Lower Antelope Canyon when they were caught by a flash flood. Only one survived and Antelope Canyon suddenly became world news. Serious flooding still occurs often closing the canyon for several months. Antelope Canyon comprises two canyons, the more popular Upper Antelope Canyon (for the light beams) and Lower Antelope Canyon. The parking lots can be found either side of highway 98 just over 4 miles from downtown Page. To get there head out on highway 98 toward Kaibeto where you find the Upper Antelope Canyon turnout. For Lower Antelope Canyon travel another 1/4 mile, then turn left on Navajo Route N22B (Antelope Point Road) for about 1/4 mile where the entrance sign is on the left. Both canyons are on Navajo land and are only accessible by permit. Four families have concessions to provide organised tours and this is the most popular way to visit. You can however, just turn up at the parking lots and purchase permits and guided tours there, but this may be hit or miss during the peak tourist season. Lower Antelope Canyon is much closer to the highway, and the entrance just a short walk from the parking lot, but is narrower, deeper and longer, and does have some steep ladders and so is a more strenuous tour. Upper Antelope Canyon is the more popular and tours can get quite busy, so booking ahead is advised. It’s also farther from the main parking lot just off the highway, so the tours drive a further 3 miles down a sandy flood plain in huge 4×4’s to reach the canyon entrance. If like me, your only opportunity to visit a location like this is restricted to school summer holidays, then you are going to be arriving in peak tourist season. 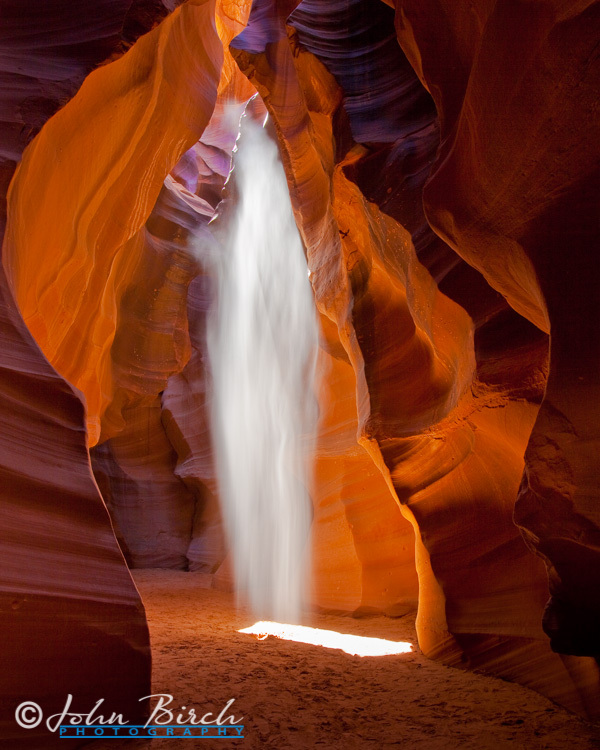 Antelope Canyon is now a huge attraction and gets very busy during this period. The good news is that July and August are best for the light beams as the sun is directly overhead. The Navajo tour companies offer hour long scenic trips throughout the day and also offer specialist, longer trips for photographers. I had read mixed reports on the tours but after a little research decided to try Chief Tosie Photo Tours. I called about a week before hand and booked a place on the 10:30 am tour. All the tours commence from in-town locations so the advertised length includes travel time there and back. The pickup location was not far from our hotel, so easily reached, and easily identified by the huge 4×4’s parked outside. These have jacked-up suspension and large wheels necessary to negotiate the sandy flood plane should conditions get wet. The photo tours are generally restricted to 12 photographers so I was surprised to see quite a mixed bunch on my tour, even more surprised to find only 2 others had brought along tripods, and that many possessed only point & shoot cameras. Having a tripod proved to be a distinct advantage. Our guide was a young Navajo chap named Mylo, who turned out to be just perfect. I’d heard some photo-guides weren’t too knowledgeable but Mylo proved quite the contrary and not only a master at having you in the right place at precisely the right moment , but a wizard at seemingly everyone’s camera, no matter of make and type. He was also a large-format camera enthusiast and an acquaintance of the renowned landscape photographer Michael Fatali. The tour was quite chaotic in parts as there were many other tours visiting at the same time. In fact judging from the number of vehicles parked outside there were probably in excess of 300 people in the canyon. However Mylo’s intimate knowledge of where and when the light beams occur, his skill at organising our party, and keeping other tour members out of our frames, more than made up for the $50 tour fee. The more serious photographers, typically those with in possession of a tripod, were generally placed in the forefront of each location and thus gained the best opportunity to take the best shots. However, what impressed about Mylo was that he made a point of coming around each member and taking a look at their composition suggesting how to get a better shot or a more interesting variation, plus for those only with point & shoot cameras he advised and in many cases set up their cameras with the correct settings to get the best exposures. In this respect I was most impressed and there shouldn’t have been anyone from our particular party who didn’t leave without some good shots on their memory cards. From my very first frame till my last was just over 1 hour 40 minutes and the time just seemed to fly by, but the whole experience was thoroughly enjoyable. I left feeling that I’d bagged some good shots and seeing them later on my laptop I was not disappointed. Mylo really made the trip however, and apart from being a really pleasant chap his expert knowledge proved invaluable. I’d certainly recommend asking for him if you book. It’s not too difficult to photograph Antelope canyon, but you don’t get that much time to photograph the light beams, as they move across the canyon floor over several minutes and the guides have to repeatedly throw up large scoops of sand which fall through the sun light and generate the ghostly beams on the images. Plus you’re going to have compete with several other tours walking back and forth in between frames. I used my full frame Canon 5D Mark II, a 16-35mm wide angle lens, a sturdy tripod and remote cable. I took most photographs at ISO 100, using exposures of 20-30 seconds at apertures generally ranging from f/22 to f/16, the majority at f/18. I found most of my shots were between 22mm to 35mm focal length, so for cameras with smaller size sensors something like a 10-20mm is going to be your best bet. I shot, as I nearly always do, in aperture priority mode and I found the camera auto exposure was just about right most of the time. There is a huge contrast difference however, between the light beam and dark canyon walls, so it’s best to keep an eye on your histogram for over exposure. Where the light beam hits the canyon floor will burn out for sure, you simply can’t avoid that, and if you did try to compensate everything else would be far to dark if not black. The canyon walls will be underexposed but that produces the lovely familiar deep red or orange glow, and the really dark areas can often take on a purple hue. Things to watch out for are the width of the beam and how soon you take your picture after the sand is first thrown up. The wider the beam, the more brighter it’s going to appear, the greater the contrast and the greater the chance of over exposing and burning out part of the beam in your image. In a few cases I compensated by –1ev. Also the beams are brightest when they catch the most sand, which is right after the initial throw when all the heavy larger sand particles fall, after that the glow grows fainter as the finer solids fall slower. I initially preferred the latter effect, which seemed to look good on the LCD at the time, producing a more streaky, flowing appearance, but when I saw them on my laptop it didn’t appear quite as effective as I thought. With the long exposures you’re probably only going to get one shot per sand throw, so you haven’t that much chance to experiment. I also found several of my early images (ones taken immediately after the sand throw) to be burnt out too much out at the top of the beam. Unfortunately I didn’t notice this at the time; an extra minus 1ev compensation (-2ev in total) would have probably been enough to reduce this and save the frame. Perhaps my best shots were taken a fraction after the initial sand throw. Conversely some parts of the canyon are very dark and the beams very narrow and I found I needed to increase the exposure by around +1ev; this I had to do in Lightroom later as I found focusing very difficult in these dark regions. Shooting in RAW is a must. Most areas of the canyon I found light enough to use autofocus. I simply selected a focus point on a near canyon wall and let the camera do it’s work. In some places I used live view and manually focussed making sure my hyperfocal depth of field was sufficient to get front to back sharpness. However there are a few really dark areas in the canyon where I struggled a little and unfortunately ended up with a few soft images. As I mentioned above I shot entirely in RAW. Jpegs just wouldn’t provide a hope of any worth while post capture processing. Most images didn’t required significant processing other than than minor exposure tweaks and standard sharpening. However, lightning some of the shadows in the canyon walls and adjusting the recovery slider to pull back the highlights in the beams significantly improved the images in my opinion. I thoroughly enjoyed my trip to Upper Antelope Canyon and despite the commercialism and crowds found in it a very rewarding photographic experience. I took the family back there later that afternoon, when it was far less crowded and they found it absolutely amazing too. It’s not cheap when you have a family of four, but it’s a very unique natural wonder which you don’t see anywhere else and still in my book a far more interesting prospect than any attraction in Las Vegas! I also ended up with some of what I considered to be my best photographs, one in particular which I now have enlarged to 24×30 inches, framed and have on the wall at home. If you ask me if I’d go again, the answer would be a resounding yes, anytime I can. Don’t forget to visit Horseshoe Bend just south of Page and a short distance from highway 89. Here you can photograph the Colorado from an overlook some 1500 feet above the river where it makes a complete 180 degree bend. It’s a breathtaking view. Alstrom Point is a location that’s not easy to find as it requires almost 30 miles of dirt road to get there, however the overlook of Padre Bay on Lake Powell is a popular sunset shoot. The Wave at Coyote Buttes (a permit is required in advance). This involves a 6 mile hike. There’s also another slot canyon called Canyon-X, only accessible via Overland Canyon Tours and 16 miles from Page, reputed to be much less crowded and limited to only 6 photographers per day. I didn't specifically adjust the exposure to increase the colour saturation, but to try and compensate and reduce the burn-out within the light beams. You're always going to get burnout where the beam hits the canyon floor, but I found the best shots were where I could avoid burnout within the beam. Some beams are narrow, but some are quite wide and require creater compensation. Also vary when you take the shot. It's brighter when there's more sand (refected) in the beam, which grows fainter as the sand falls. I shot all on auto-white balance and found that I've adjusted most of them slightly in Lightroom. Some not at all. The walls, if under exposed can come out purple in the shadows, so I warmed them up, but not by much. Reading my review I wished I'd tried some wider apertures as perhaps I didn't need that much depth of field in some of the place. However, it's quite chaotic, time goes pretty fast, and you don't get that many chances to experiemnt. It's great fun however, and I'd love to try it again someday.